Saalbach is set in the province of Salzburgerland. This magnificent ski area is renowned for its excellent range of pistes and efficient lift system. The Skicircus Saalbach Hinterglemm Leogang Fieberbrunn boasts 270 km of slopes and is one of the largest ski areas in Austria. Beginners have 140 km of blue pistes to learn their first turns, while intermediates will enjoy the 112km of red runs across the ski area and experts have 18 km of black slopes to test their skills on. In winter 2015/16 a new high speed gondola named ‘Tirol S’ will connect Saalbach-Hinterglemm-Leogang with Fieberbrunn increasing the ski area to 270km making it one of the largest ski areas in Austria. On powder days you'll also find tremendous off piste through the trees, and local guides eager to show you the way. Saalbach itself is a superb ski resort with an attractive village centre and a lively, traditional atmosphere. 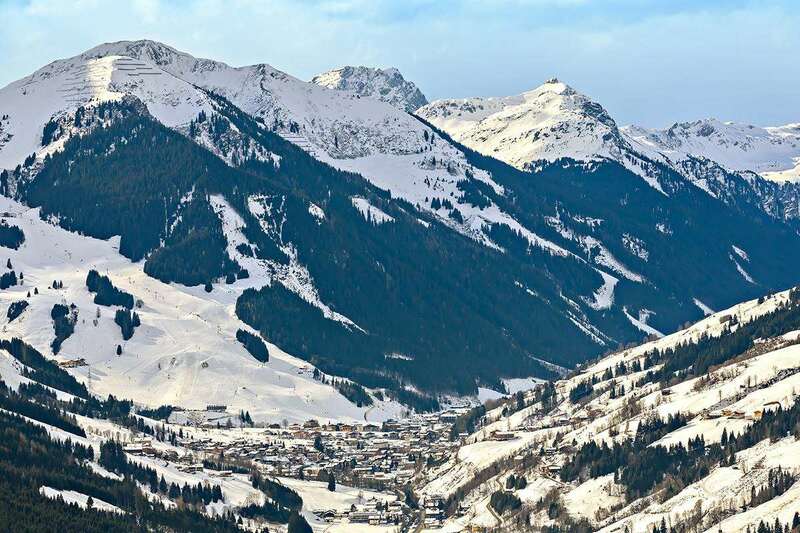 The area has an excellent snow record as well as some wonderful sun traps where you can sit out on the terraces of rustic mountain restaurants, relax and enjoy the views on your ski holidays in Saalbach. Ski holidays in Saalbach allow you to explore the large ski area, with over 200km of pistes in the Alpine Circus and is linked to the neighbouring ski resort of Leogang. With such a large ski area there is terrain to suit all levels on ski holidays in Saalbach, although it does favour the intermediate cruiser. Almost all of the ski circus ski area has snow making facilities which contribute to the natural snowfall for more guaranteed skiing throughout most of the season. Saalbach has a reputation for superb nightlife and boasts a number of popular haunts. The villages have more than 30 pubs and bars and 9 clubs/discos. During the day top-prepared, beginner-friendly but selective slopes – right down to the village. But as soon as dusk falls the party fever in Saalbach Hinterglemm begins-side bars come to life, followed by the villages' pubs, bars and clubs with DJs and regular live music - taking you through until the early hours with your ski boots still on. Saalbach is a favourite for families. 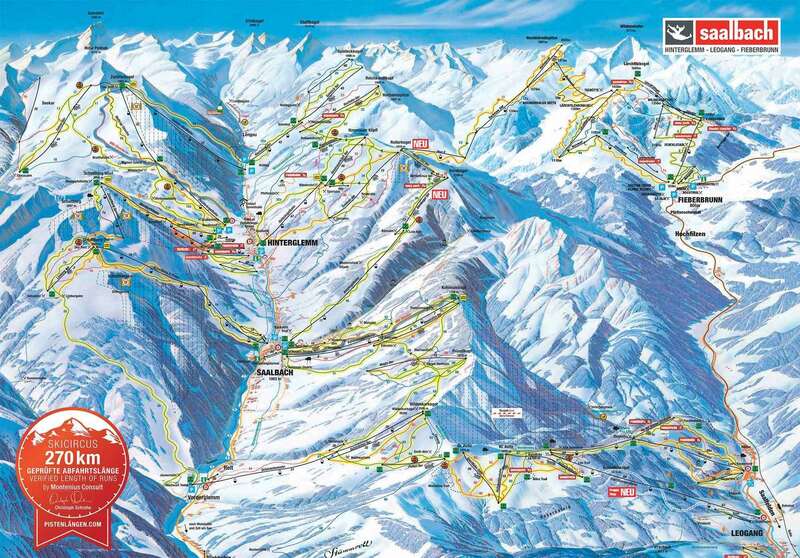 The resort has an amazing 270km of ski slopes, including 112km of blue pistes, perfect for mixed abilities and ages. There is a first class ski school where you’ll be well looked after. Off the piste, there are two floodlit toboggan runs, including a route that goes down into Hinterglemm which is 3.5km long! This is great fun for the entire family. Other activities include tubing, curling, paragliding, snow parks and horse drawn sleigh rides - the family definitely won’t get bored in Saalbach Hinterglemm. With plenty of umbrella bars, pubs and discos means Saalbach Hinterglemm can be classed as one of the best après ski destinations in the Alps! Hotels in Saalbach are large enough to handle big groups, this teamed with a short transfer and plenty of skiing means that Saalbach is a great all-round destination to keep everyone happy. Just 86 km away is Salzburg international airport which is a short drive or bus transfer from resort. Innsbruck and Munich are also close by. One of the best ski holidays ever was our trip to Saalbach. Having skied many French resorts, a good few Italian, and Swiss over the years, I was not disappointed by Saalbach. Plenty of good skiing for us intermediates and enjoyed some of the blacks too! Some links needed a bit of walking, not due to lack of snow - it hardly stopped, just due to the lay of the land! Brilliant apres-ski - go to the Goat Hut, dance on the table, then watch everyone try to ski down the slope to the road! I booked through Iglu Ski for a party of four at Hotel Club Riegler, Saalbach over the Christmas week and was very impressed with the service they gave. The travel documents were sent promptly and found the online payment service and website extremely easy and better to use than any of the others. The transfer from Salzburg airport was over 2 hours (Although the rep stated 1 and a half), and the hotel was about 8 minutes walk to the town and slopes, and at the base of a steep 30m driveway (Buy a set of CAT TRACKS for your ski boots and a strap for your skis if you are staying here). The hotel did load our kit onto a trailor and take it up the hill though. We arrived at the hotel and I was pleased to hear that they fitted boots and skis the same evening IN the hotel, which was a far easier and better option than going to the ski shops the first morning of the holiday and wasting time. The staff at the hotel were very friendly and helpful however, and food was of an adaquate standard, the hotel manager Paul was a very helpful and polite American chap that always made an effort to say hello and ask how things were. The ski resort is at 1000m but the snow blowers and piste bashers are always busy though and the slopes are fantastic the following morning. Not many black runs, but the reds and blues are generally harder than they are graded, so quite challenging. The best area to ski was the northwest slopes at Hinterglemm, the competent slopes are fantastic in the morning as they are pisted lovely and long, with plenty of local competent skiers, the views are amazing. As learners, Saalbach has a fantastic beginners area based in the centre of town, unused by competent skiers. This had all the facilities and button lifts to accomodate learners, very impressed, great resort to learn in. Iglu Ski service was very good. 6/10 for the hotel, 9/10 for learners, 6/10 for competent skiers, 8/10 for 'lads holiday' .